One question I see almost more than any other in the various CF Forums I follow is: Do Salt Lamps Work? Most patients with cystic fibrosis use or have used hypertonic saline as part of their treatment regimen. Hypertonic saline therapy was born out of reports that CF patients who surf, and spend a lot of time in salty ocean air, tend to have an easier time expelling secretions thus leading to fewer infections and higher lung functions. So with the notion that water follows salt (a process in our cells known as osmosis), and that cystics are always losing salt and dehydrating, we adhere to the belief that extra salt equals thinner mucus. But not all of us live at the beach, and some people are too sensitive to nebulize hypertonic saline directly into their lungs; there’s got to be an easier way, right? Enter the Himalayan Salt Lamp. Now, I’m not a chemist, but the last time I checked, salt does not have any oxygen atoms in its molecule. So the claim that salt lamps rejuvenate your senses with fresh oxygenated air is confusing at best (I’ll go in to what I think they mean by this later). 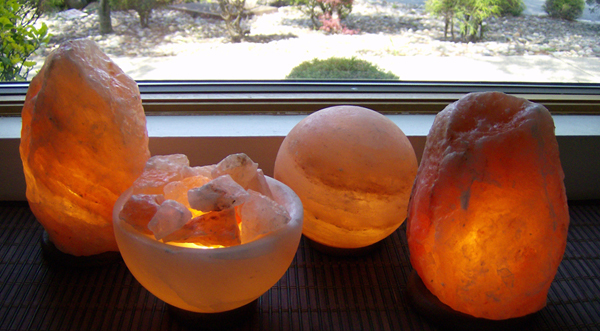 Let’s take a look at the buzzword surrounding the rest of the salt lamp claims: ionization. By the way this word is passed around natural healing product websites, one might think it’s the discovery of the century, with the potential to cure the world. It sounds sciencey enough. Ionization occurs when a molecule has a different number of protons than electrons. Having more electrons creates a negative charge; more protons create a positive charge. Many electric devices pull electrons away from their energy source, thus emitting positive ions, which some people posit are bad for your health. Without going into the research on whether or not that’s true, one thing’s for sure, the pseudoscientific marketplace has latched on to the negative ion as a remedy. Negative ions, not unlike positive ones, occur naturally all the time, the biggest examples being around high energy features like waterfalls, crashing waves, thunderstorms etc. (For what it’s worth, you can also create negative ions by rubbing a plastic comb against your hair). The makers of salt lamps claim that when the salt crystal is heated up, it attracts moisture from the air, and releases negative ions which you then inhale for relief of all proton-induced malaise. This is wrong on several levels: For one, heat does not attract moisture. Think about when you have a cold drink; after a few minutes of being in air that is warmer than the glass/cup/can, the container “sweats” meaning condensation begins forming around the glass/ cup/ can. This happens for the same reason dew forms on the grass in the chilly morning hours when the sun is just beginning to warm the air. Now think about the last time you had a hot drink. Did the cup ever get wet on the outside? No. Heat does not attract moisture. Next, if your salt lamp became damp each time you turned it on, it would slowly dissolve into a puddle of salt water on your table. Now, let’s move on to this business of ionization. Salt, as you probably remember, is a molecule made up of one sodium and one chloride atom (NaCl). Sodium has a positive charge, chloride a negative charge and they are bound together in an equally weighted cation/anion structure. In order for the lamp to release negative ions, there has to be a supply of surplus negative ions coming from somewhere. It’s not from the salt; it can’t be from the electrical circuit because those electrons are being used to keep the lamp lit, so where are these ions coming from? It is possible to separate sodium from chloride with high amounts of energy, but we’re talking much more than what is put out from a mere 15 watt lamp. But let’s just say that somehow this glowing chunk of halite on your night stand actually does release negative ions to combat the pollutants in the air. What would happen is your salt lamp would basically slowly shrink down to nothing but a pile of pure sodium (not good), and at the same time be emitting chlorine gas (really not good). And then there’s the logical paradox that if these negative ions are floating away, leaving the positively charged ions in the lamp, the strong attraction between positive and negative would pull these negative ions right back onto the lamp, negating entirely the purpose of your salt lamp. Going back to the claim that salt lamps rejuvenate the senses by oxygenating the air, I maintain that this is a misleading statement. However, as cited in a WebMD article titled, Negative Ions Create Positive Vibes, Pierce J Howard, PhD and director of research at the Center for Applied Cognitive Sciences in North Carolina says, “Generally speaking, negative ions increase the flow of oxygen to the brain; resulting in higher alertness, decreased drowsiness, and more mental energy…They also may protect against germs in the air, resulting in decreased irritation due to inhaling various particles that make you sneeze, cough, or have a throat irritation.” Dr. Howard is not an MD and he doesn’t explain how negative ions are able to do this, but I assume WebMD vets their sources before publishing, so I’ll give him the benefit of the doubt that there is some truth in this. So perhaps this is why some salt lamp companies make the leap to say that having their salt in the room is like breathing the freshest air in the world. The article goes on to talk about the benefits (or not) of air ionizers, which do put out clinically measureable amounts of negative ions and are thought to electrostatically attract dust particles, trap them, and remove them from the air. I have seen this claim on some salt lamp websites too. But I have a problem with this. Not because we’ve got lots of evidence to reject the hypothesis that salt lamps emit negative ions, but because if the negative ions did bind to dust particles and allergens, and other pollutants that could trigger asthma symptoms, there’s no chance of them being heavy enough to weigh the dust down, trap it against a grounded surface, and make it easy to just wipe away. In a brilliant post on the effectiveness of salt lamps, author D.B. Thomas asserts the weight of the chlorine molecule to be very small. “Chlorine has a relative atomic mass of 35.5. Basically, a “mole” of chlorine atoms 6.022 x 10^23 atoms) would weigh 35.5 grams. Let’s break that down to numbers that most people can readily understand. 35.5g/6.022×10^23 = 5.887×10^-23 grams. Or, 0.00000000000000000000005887 grams.”  As if that would be enough to bring down a comparatively enormous dust particle. Furthermore, after 30 years of research, most pulmonologists agree that air ionizers do not show significant benefit to the health of asthma suffers (among others). In fact, studies of air ionizer machines found that in living up to their claims on negative ion production, they also create a worrisome amount of ozone. Ozone has its ups, like killing bacteria, but unfortunately it can also kill humans. Bottom line, be wary of any product claiming to neutralize the air through negative ionization. Lastly, I simply must address the total marketing gimmick that is Himalayan salt. If you believe the hype, you might be convinced that Himalayan salt is the purest, healthiest salt in the world. Plus it’s pink. Though I am baffled how sellers will tout the purity of the salt, and then go on to explain that what makes Himalayan salt unique is its mineral impurities. It’s true, Himalayan salt is only about 95-98% pure NaCl, with most of the rest being gypsum. As it is said in the Skeptic Podcast on Salt Cave Therapies, Trace elements of about 10 minerals are usually found. Although gypsum is recommended in some alternative medicine schemes, no sound medical research has ever found any benefit from consuming it. The fact that a lot of Himalayan salt is pink in color is due to contamination from iron oxide. Essentially, it’s rusty. It’s not my intention in this blog to discuss the caveats of business ethics within the companies and where the salt is sourced from. I will, however, say that chemically, sodium chloride is sodium chloride, whether it is mined from the ground, taken from the sea, or created in a lab. There’s no such thing as “knock off” salt lamps. The high cost of Himalayan specific salt is because of pure marketing genius, and not much else. I will conclude this rather detailed blog post by saying that in my opinion salt lamps are quite pretty. They give off a warm orange glow, whose ambiance is soothing, and restful which I suppose could reduce stress and improve general emotional wellbeing. I have no plans of ever purchasing one, but admittedly, I’d be very happy to be gifted one. If you wish to buy a salt lamp for their beauty and relaxation qualities, it’s probably money well spent. But please have no illusions as to their health effects. It could never possibly replace hypertonic, or even complement your respiratory treatments. It’s also probably not a good idea to lick them. Just saying. Update Oct 29, 2016: Another informative post, written by a Ph.D, details some of the misinformation regarding Himalayan salt benefits and how it can cause real harm to uninformed patients can be found here. The blog Healthy but Smart covers a variety of topics and I recommend checking them out for good evidence-based information for online health claims.